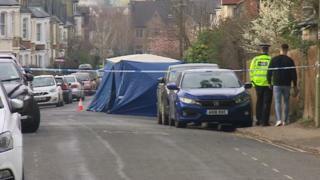 Two men have been arrested on suspicion of attempted murder after two men were stabbed in Oxford. The victims, both in their 20s, were attacked at 23:30 GMT in Southfield Road on Wednesday, one remains in a critical condition. A 20-year-old man from Oxford and another man, 19, of no fixed abode, are being held in police custody. Two men who had previously been arrested in connection with the stabbings have been released. Police had thought a third victim was hit by a car but Det Ch Insp Dave Turnton said police now believe "the man who is in a critical condition was involved in a collision with a vehicle prior to being stabbed". A car connected to the stabbing was recovered by police on Friday. The second victim is described as being in a stable condition. Thames Valley Police previously said up to 10 people could have been involved in the attack. A 21-year-old man from London who was detained on Sunday has been released without charge. A 22-year-old man of no fixed abode who was arrested on suspicion of wounding with intent has been released on bail until 27 March.